Our travels today took us from Dol de Bretagne southeast to Fougeres and Vitré. Both are towns with chateaus and medieval castles, and some of the best examples of them in France. They are two of our favorites. It’s so difficult to have favorites in France, as there are so many wonderful French villages, but these two rank up at the top. 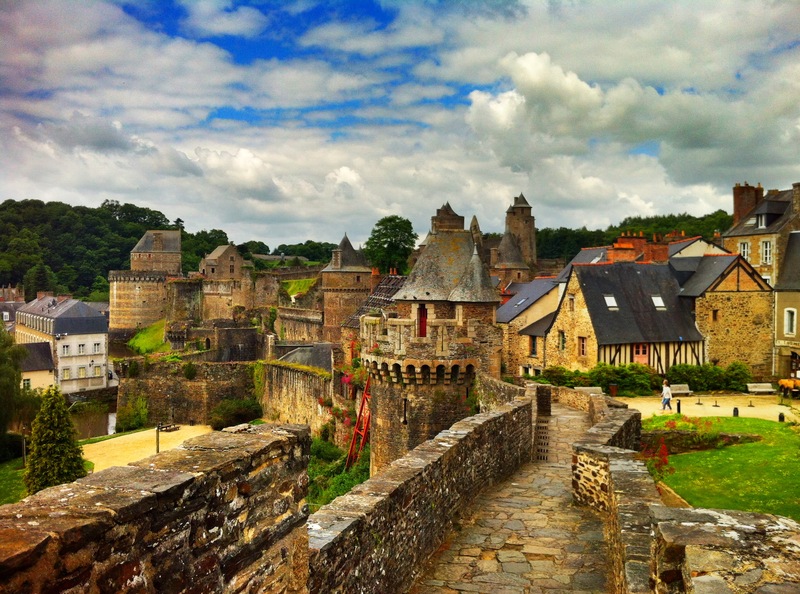 Fourgeres is divided into two, with a lower part encompassing a medieval castle and town, and the upper, more modern town of Fougeres. A good way to start is in the upper part of town and then work your way downwards to the castle. You can walk through the public gardens of Place aux Arbres, which features terrific views of the castle medieval town below, and features hundred different versions of ferns (Figueres translates to fern). As you go walk through the gardens by way of a footpath you’ll make your way to the lower part of town (actually more scenic as most of the upper town had burned down in a fire in the 18th century) and the castle. As always, grab a map at the tourism office.